The lil’ fox is incredibly difficult to photograph in my poor-lit house, but the gold thread is much more noticeable in real life. While making my grey Colette Truffle dress recently, I began thinking about different ways to embellish garments to add a special, personal touch. I love that the Truffle has a simple style as it makes it really easy to accessorize for different situations – it’s a very handy go-to dress to have in the wardrobe – but I was also itching to add something more permanent to it to spice it up a bit. Around that time, Ingrid of We The Sewing posted about embellishing clothing with embroidery. On reading her tips, I knew that this was exactly the technique I wanted to try out. So when Tilly Walnes released a preview of the lovely projects included in her new book, Love at First Stitch, I immediately thought of making a simple grey Delphine and trying some hand embroidery. Happily, I still had some of the soft suiting fabric I’ve used on my Frankenskirt and Truffle dress, and I traced out the Delphine pattern as soon as I got my hands on the book. I pinned a sketch of the fox to the skirt in different places to check the position I wanted before tracing it on to the fabric. 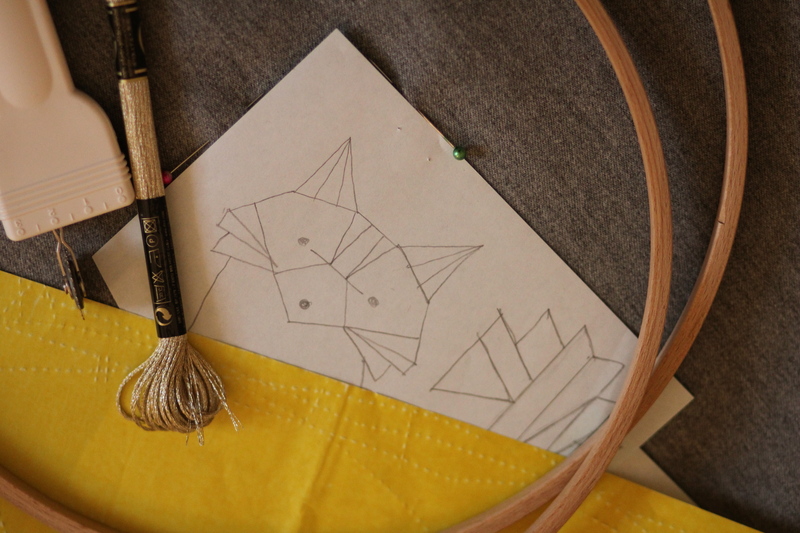 This is my first time embroidering anything on clothes and I followed Ingrid’s great tips for planning the project, from sourcing a simple line drawing via Pinterest (this fox), to tracing the pattern onto the fabric using a wheel and dressmaker’s tracing paper. Initially, I planned to stitch a bright blue or neon pink animal character onto the skirt, but when I was looking through the skein selections at the beautiful haberdasher A Rubanesque, I discovered some amazing metallic DMC threads and decided that gold (shade: E677) would be perfect for this project. I used an embroidery hoop to keep the skirt fabric tight enough to stitch without puckering, but clamped it loose enough not to crush and mark the fabric. I divided the skein into two-strand threads for sewing because one strand was too light and I was worried that three would tangle. I should note that this metallic thread was more liable to split and fray during sewing so I found it easier to work with shorter lengths, and I just used backstitch. I’m really happy with how this first foray into embroidery embellishment worked out. 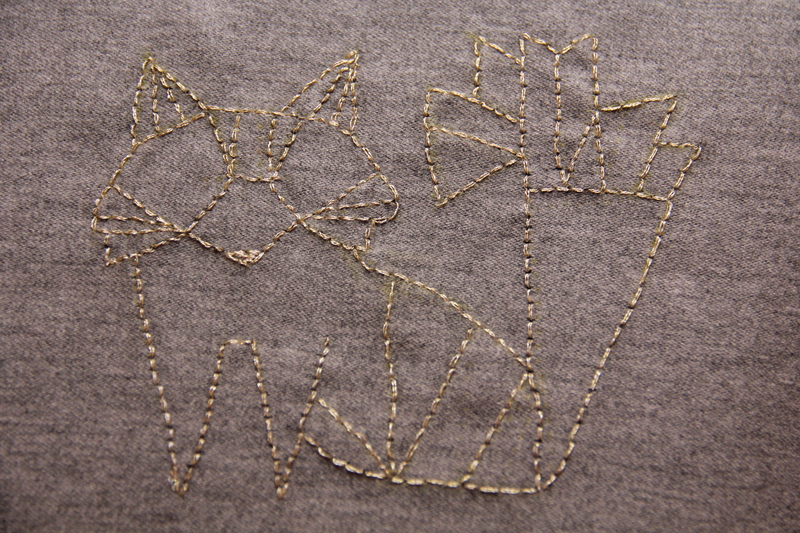 I like the simplicity of Delphine’s design and the subtle shine of the little golden fox against the soft grey fabric. There’s a stronger contrast between the yellow of the thread and the skirt fabric in real life than in these photos, and the fox sparkles a little when the light catches him. I also managed to get the invisible zip in really smoothly using my regular zipper foot (yes, I’m done with that pop-on invisible zipper foot!). 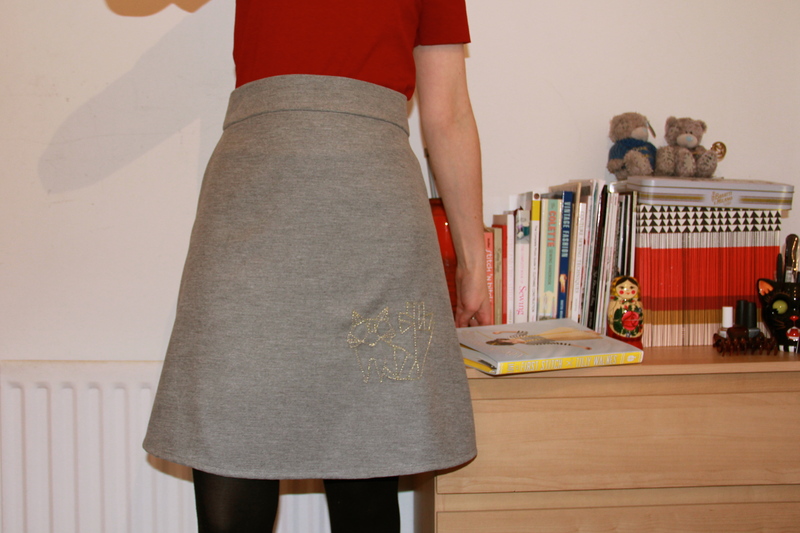 The Delphine is a lovely simple skirt to sew and, as with all the projects in her book, Tilly includes a range of simple but inspiring ideas for customising your skirt. I already have two excellent sewing books for learning new techniques, The Colette Sewing Handbook and The Complete Photo Guide to Garment Construction by Christine Haynes (I think Tilly’s book sits somewhere between the two) but I was really drawn to the patterns included in Love at First Stitch. I’m currently working on a Clemence skirt with fabric from my stash and hope to try my hand at the Mimi blouse soon too. I won’t go into outlining the new book at length as there are already plenty of reviews out there from its blog tour (House of Pinheiro has compiled a particularly good overview), but I do think it’s brilliant value for five lovely and very wearable patterns, as well as being a handy sewing guide. 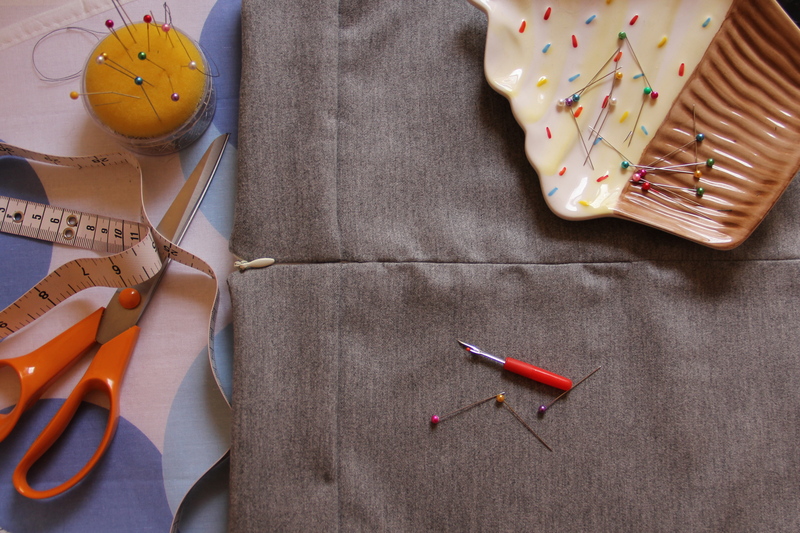 There’s no harm in having more than one reference when you need sewing advice in a pinch – sometimes the different descriptions can help something click better. A second sewing book I bought recently was a beautiful guide to cross stitch by Sophie Simpson called Storyland Cross Stitch – so I might be trying some cross stitch on clothing soon too! Have you tried any new clothing embellishment techniques? How did they turn out? After hitting some serious snags in a project I’m working on for A Sewing Odyssey’s vintage pattern pledge, I took a bit of a break from it this week to clear my head and do some stress-free sewing. 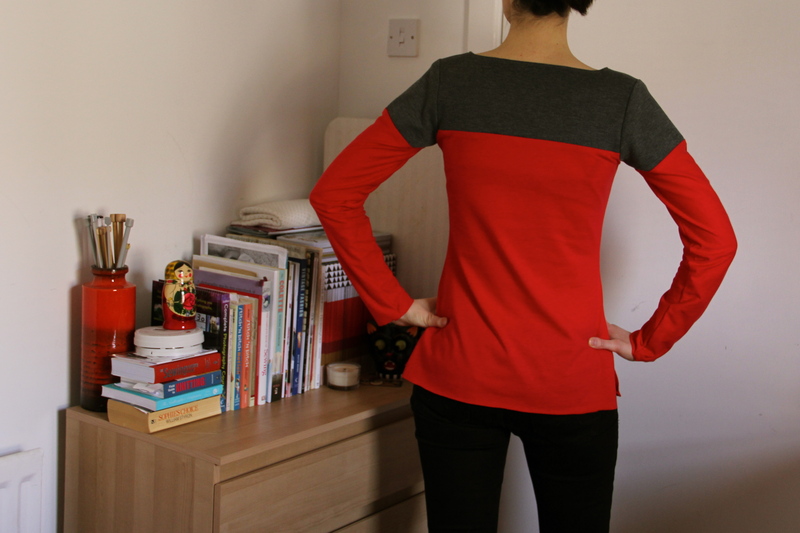 I’ll keep this post brief because I’ve already written twice recently about using this lovely pattern from Tilly and the Buttons: first, I made a grey long-sleeve roll-neck dress, then I had a go at hacking the pattern to make a sporty, casual, colour-blocked top. Even after both of those projects, I still had some of the grey fabric, which I bought specifically for Coco, left over. A couple of weeks ago, I spotted this lovely gold ponte on Guthrie and Ghani’s website and thought it would make a nice contrast against the grey. 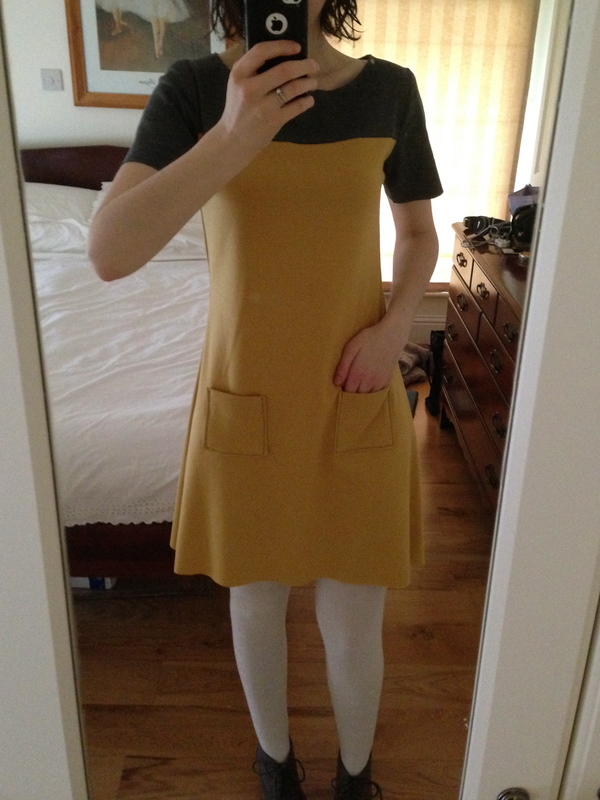 I also wanted to finally have a go at making a Coco which incorporated pockets! I’m not a particularly quick sewer, but this pattern is so speedy to make up that I was able to put this dress together completely before lunch on Wednesday (unusually speedy for me!). The pattern is also simple enough to allow multiple adaptations (check out Tilly’s Pinterest board of Cocos for some brilliantly creative examples, like House of Pinheiro’s second Coco). 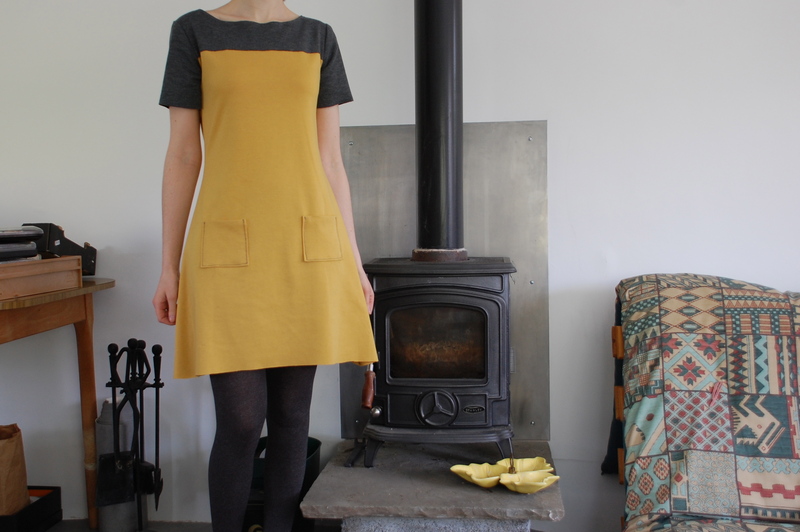 I absolutely loved working with the Coco pattern by Tilly and the Buttons when making the roll-neck dress version recently and I couldn’t wait to try making a top with it. 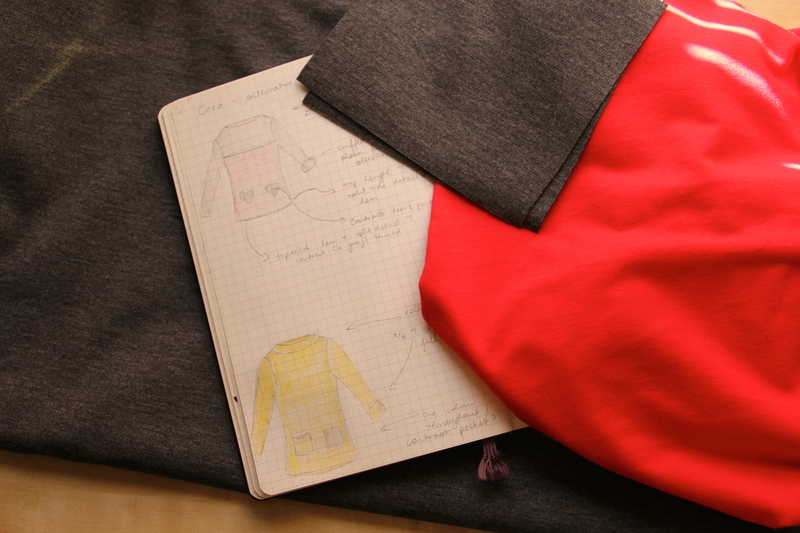 I found it quite difficult to find suitable knit fabrics in Dublin, but last week I came across a lovely bright red double knit in The Cloth Shop, where I bought the grey knit for my Coco dress. It’s considerably lighter in weight than the grey fabric, but has only 2% stretch. I had a good bit of the grey knit left over from Coco #1 and thought it would work as a more stable and contrasting fabric alongside this bright red knit in a colourblocked Coco. So, I used the heavier material as a yoke and shoulders and used the lighter stuff to finish the front, back and sleeve lengths. There was a lot of guesswork involved in figuring out how long I wanted the yoke, or how much of the grey I wanted in the sleeves, so cutting the fabric involved a lot of procrastination! (Happily, Tilly has since posted a handy tutorial online for making a contrast yoke Coco.) I was worried about where the seamline would sit on the bust and how that might affect the way it sits. I was also uncertain about how to match up the grey part of the sleeves with the front and back, but think I’ve figured that out now (learning by doing!). 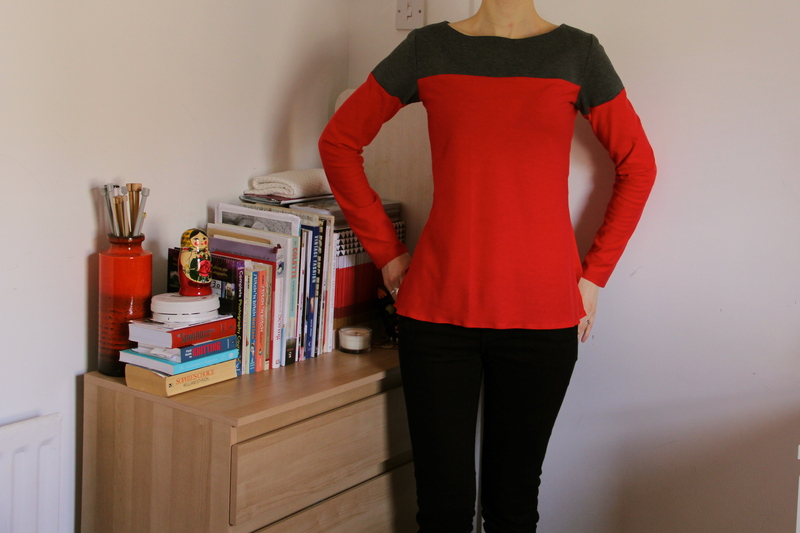 It’s the most sporty item I’ve ever sewn (and I think it went a bit Star Trek with the colours I chose…) but I like the fit and it’s so soft and comfortable to wear! I’ll wear it a couple of times to check the fit, but I might just take in the upper sleeves slightly as they’re a tad loose. 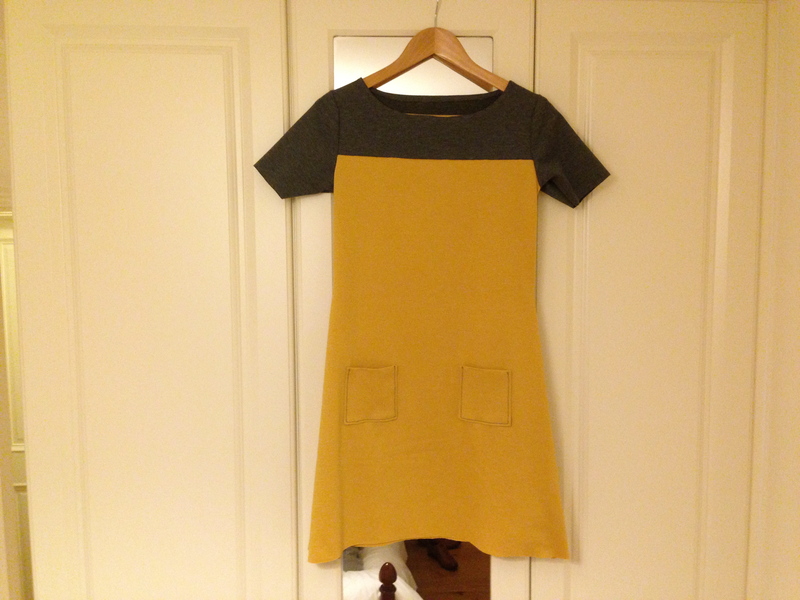 Interestingly, I didn’t have any sleeve issues with my grey Coco dress, though I have read other bloggers finding them too loose (might be something to do with the weight of the grey fabric?). I had planned to put some cute contrast heart pockets on, but thought better of it after handling the fabric a bit more – I think the red would sag under pockets. I had been putting off sewing knits and jerseys because I don’t have a serger, but I think this pattern has given me the confidence to try my hand at other jersey fabrics and patterns, like this cute dress by Salme (who are having something of a sale at the moment) or the much-blogged Renfrew by Sewaholic. And speaking of sewing knits, have you seen that Colette Patterns is bringing out a book dedicated to the topic AND new patterns for knits? 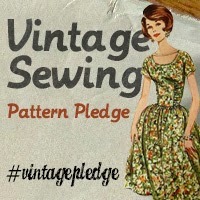 If you subscribe to their book/pattern announcement list here by 8 April, they’ll send you a free chapter of the book before its release. Skills learned: Working with knits; mixing fabrics. Recommend pattern? : Definitely! 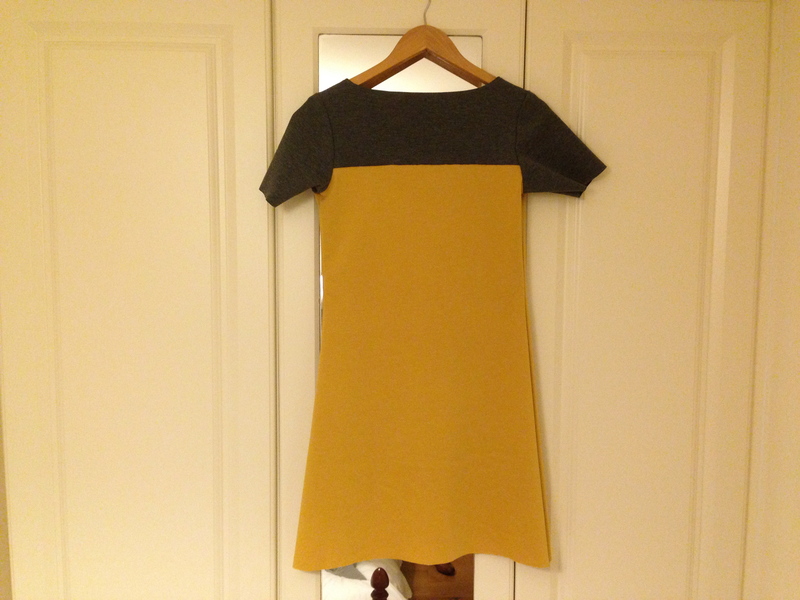 It’s a very satisfying simple pattern and having made both the dress and the top options, I can officially say I’m hooked on (a) this pattern and (b) sewing with this kind of fabric. Normal service to resume shortly!